The US Department of Agriculture (USDA) and the Department of Health and Human Services (HHS) issue dietary guidelines for its citizens every five years. These form the basis of the country’s nutritional policy. This year, when recommendations for the 2015 dietary guidelines were opened for public comment in February, it created quite a storm in the US Congress and the food industry. 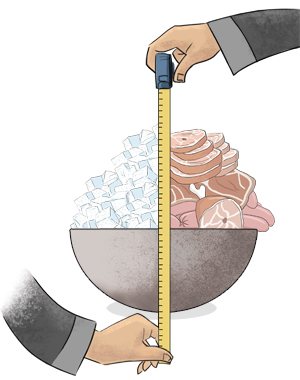 The recommendations contained two unprecedented propositions: one, they introduced environmental sustainability as a concern and proposed limited consumption of meats for a healthier and planet-friendly diet; and two, they recommended that not more than 10 per cent of calorie intake should be from added sugars. “Average US diet has a larger environmental impact in terms of increased greenhouse gas emissions, land use, water use, and energy use. This is because the current US population intake of animal-based foods is higher and plant-based foods are [sic] lower, than proposed in dietary patterns,” state the recommendations. The solution is a diet “higher in plant-based foods, such as vegetables, fruits, whole grains, legumes, nuts, and seeds, and lower in calories and animal-based foods”. The recommendations led to a no-holds-barred debate, with senators and the food industry on one side, and pro-environment groups on the other. Thirty senators shot off a letter to USDA and HHS, protesting against the recommendations and questioning the expertise of the Dietary Guidelines Advisory Committee (DGAC)—which makes the recommendations on the basis of new scientific developments—to discuss environment sustainability. DGAC comprises some of the country’s top scientists and nutrition researchers. The meat industry launched campaigns like “Hands off My Hotdog” to counter the recommendations. Media reports say the recommendations created such a stir that USAD and HHS received close to 30,000 comments, against 1,200 comments received for the 2010 recommendations. The guidelines will be released later this year, and implemented from 2016. In the US, industry interference through lobbying and funding is an open secret. “The cattle industry donated more than half-a-million dollars to the senators listed in the letter in the previous campaign year,” says Laura MacLeery, chief regulatory affairs lawyer at the Centre for Science in the Public Interest (CSPI), a non-profit which advocates on issues of nutrition, health, food safety and science. CSPI’s analysis also shows that sugar manufacturers were among the top donors to many senators and representatives on agriculture and labour/HHS appropriations committees. Marion Nestle, author of Food Politics, and professor of nutrition, food studies, and public health at New York University, points out that in 1991, the meat industry forced the USDA to withdraw its food guide pyramid which displayed meat towards the narrow top (highlighting its low requirement in the diet). “Eventually the USDA released almost the same pyramid but with some changes that appeased the meat industry,” Nestle told Down To Earth. In her book, Nestle also points out how the 1980 and 1985 guidelines obfuscated the issue of sugar consumption by asking people only to avoid too much sugar. In making these recommendations, DGAC has followed European countries. The Netherlands was perhaps one of the first to include an ecological perspective in its dietary guidelines in 2011. In April 2015, Sweden, too, urged people to limit consumption of red and processed meats and dairy products. Germany has also introduced a sustainable shopping basket. The thrust of all these recommendations is similar—limit consumption of animal-based foods, sugar and salt. In South America, Brazil pushed the envelope in 2014 by issuing guidelines that listed the food items that should be eaten, and not the nutrients. Carlos Monterio, a nutrition expert and one of the formulators of the Brazilian guidelines, says that the new guidelines are a way to pre-empt the disappearance of traditional and local dietary habits and to ensure that consumption of sugary drinks and ultra-processed foods does not impact the dietary patterns in Brazil, like it did in the US. Apart from advocating environmental sustainability, the guidelines also devised the concept of “ultra processed foods” to differentiate them from minimally processed ones in terms of nutrient and health effects. With Brazil struggling with a nutritional anomaly—malnutrition on one hand, and rising obesity on the other—the new guidelines seem to be a timely intervention. But like US, the new guidelines faced resistance in Brazil too. “During public consultations, they (manufacturers of ultra-processed foods) criticised almost every guideline recommendation and even tried to stop the promulgation of the guidelines, but with no success,” says Monterio. In India, the issue has had its share of controversies. In 2014, the Food Safety and Standards Authority of India (FSSAI) set-up an expert committee to frame junk food guidelines for schools after a High Court order. The guidelines submitted by the committee were mellowed down by FSSAI before being presented to the court. The guidelines had recommended restriction of junk food within 500 m of school, which was changed to 50 m. A complete ban on junk food in schools was also not allowed. In another instance last year, Food Processing Minister Harsimrat Kaur Badal asked PepsiCo India head, Indra Nooyi, to develop “nutritious processed foods” for the Rs 13,000 crore mid-day meal scheme. This was despite a 2001 Supreme Court order that made providing freshly cooked food mandatory in mid-day meals. Badal’s ministry later retracted the statement. T Longvah, director, National Institute of Nutrition, Hyderabad, denies that the industry is involved in the process of framing the dietary guidelines. He, however, admits that there is a possibility of the industry funding research projects to promote its own agenda. “Published results from such projects could be used for developing dietary guidelines,” he says. When commercial interests dominate politics and public health, is there a way out? The World Health Organization, which had come under scrutiny due to an increased proportion of funding from non-state players like corporates, is now trying to lay down a Framework of Engagement with Non-State Actors to address this conflict of interest. A funding reform in political campaigns is a must, says Robert Lawrence, director, Johns Hopkins Center for a Livable Future. Nestle says that passing a law against industry influence is unlikely as the current Congress bends to pressure easily. She says advocacy for transparency of corporate influence, and publicity of undue interference can make a difference. Experts say that India too should look at issues of environmental sustainability while framing dietary guidelines, like Brazil, even though the protein intake in the country is low and diets, largely vegetarian. “Plants sources are environment friendly. Unlike western countries, India’s high-quality protein intake is low and is provided by pulses. India should focus on increasing pulses production. It is environmentally sustainable too because pulses fix nitrogen in the soil,” says Anura Kurpad, head of the nutrition division at St John’s Research Institute, Bengaluru. He says that though Indian dietary guidelines refer to sugar intake and soft drinks, they still need to focus on ultra-processed foods because the market is flooded with processed food. For a country like India, where the industry interference is covert, pre-emptive steps could be useful. 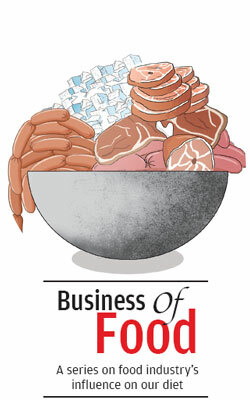 “India is moving towards a scenario where people might consume more ultra-processed and ready-to-cook foods. If the government looks at proper labelling of foods and generates awareness, it could pre-empt a surge in the consumption of these products,” says Kurpad.